This is a difficult but fun freestyle trick that leaves you upright with your arm outstretched. “It’s not a particularly practical move on your daily ride; it’s more to show off in front of your local 7-Eleven,” says renowned mountain biker Hans Rey. 1. Stand on the right side of your bike. 2. Lock the rear brake with your right hand. “My rear brake is on the left side, which is why it appears opposite in the photos,” notes Hans. 3. Upend the bike next to you. 6. 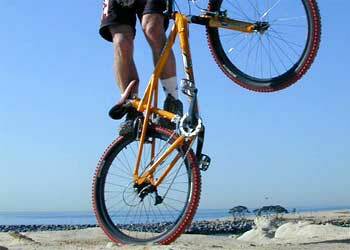 Begin hopping your bike immediately to keep your balance. 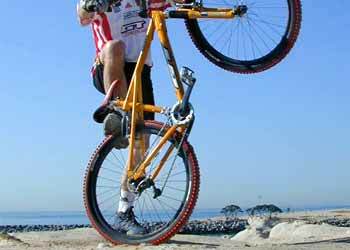 Your center of gravity should be directly above the rear hub. 8. Reverse each movement to dismount. 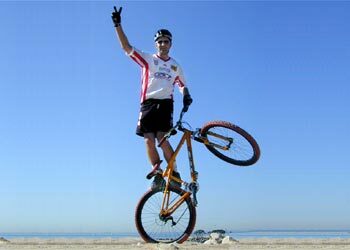 If you begin to lose balance, jump off with both feet and stay clear of your bike. You don’t want to land on the wheel and bend it. Be careful – it is extremely difficult to keep the bike from folding beneath you after losing balance. Try not to land on top of it.